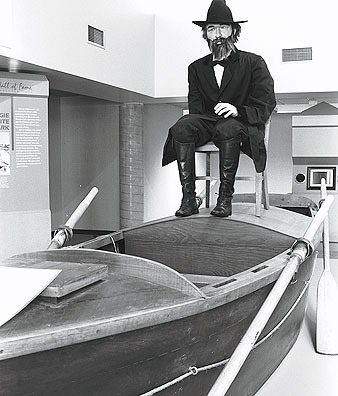 On This Date in History: John Wesley Powell was born in 1834 near Mt. Morris, New York. Soon thereafter, the family moved to Ohio where it was difficult for the family, largely due to the Powell’s strong anti-slavery sentiment built on their Protestant Faith. Ohio, at the time, was generally in support of slavery and young John felt so uncomfortable that he withdrew from public school and was instead tutored by a local naturalist named “Big George” Crookham. 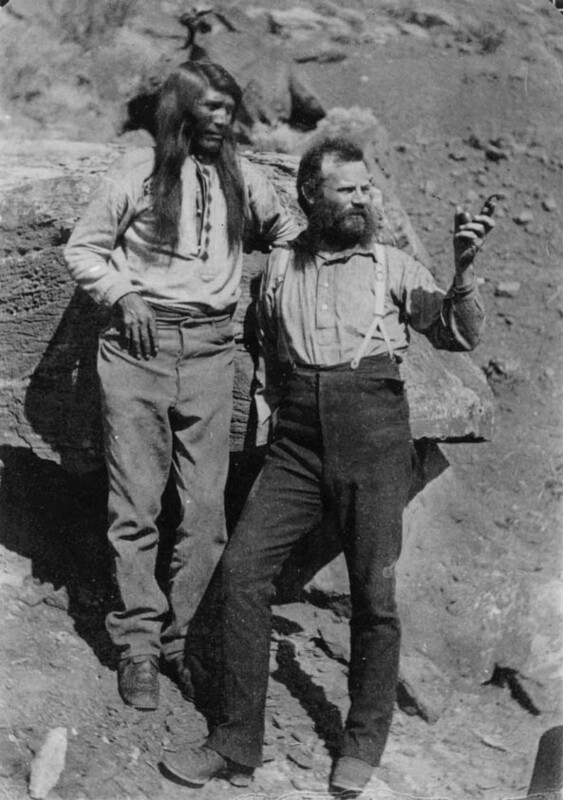 Crookham had a great deal of knowledge and interest in plants, animals, rocks and various artifacts that he shared with John Wesley Powell. This seemingly innocent relationship not only had an extreme effect on the rest of Powell’s life, but also on the direction of the United States government and some of its policies. In 1846, the family moved to Wisconsin to a farm that was adjacent to several Indian tribes. Powell developed a strong bond and appreciation for his Native American neighbors. Four years later the family again pulled up stakes and this time came to Illinois. In 1857, Powell attended Oberlin College and felt quite comfortable studying Greek, Latin and botany since the state and college campus held anti-slavery views that were similar to his own. It was his anti-slavery position that led him to join the Union Army at the outset of the Civil War. At the Battle of Shiloh, Captain Powell was in charge of an artillery battery. At one point , he raised his hand to signal for the battery to fire when he was struck by a minie ball in his left wrist. Now, the “minie” part of the minie ball is a true misnomer because there was nothing small about it. In general, minie balls came in either a .50 caliber or .58 caliber variety. It was essentially a huge lead sphere that had a tendency to flatten out on impact and cause massive destruction to a human body. With that in mind, Powell had his left arm amputated. But, in an illustration of Powell’s determination, he not only recovered by rejoined the army. He participated in the battle of Champions Hill and the Seige of Vicksburg and rose to the rank of Major and later was breveted to Colonel. Most of the time, a Civil War officer would use his highest rank acheived as a title but, Powell went by the title of “Major” after he left the army; for Powell that was in 1865 when he resigned. Powell had determined that his disability was limiting his usefulness. But that doesn’t mean that he let it get in the way of the rest of his life. He took a job as a professor of Geology at Ohio Wesleyan University and then the same position at Illinois State University and became curator of the Museum of Natural History which was run by the Illinois Natural History Society. It was from that position of authority that he led his first expedition of the Colorado and Green Rivers. Remember, in 1869 no one had ever mapped the Colorado River, which was in places a rough and turbulent river that snaked its way through a rough and challenging terrain. So, Powell and his team of 9 literally were looking to traverse uncharted territory. The ten men departed from Green River, Wyoming on May 24, 1869 amidst whoops and hollers from well wishers as they began their journey down the Green River. They assumed their journey would be a long one as they took provisions for a 10 month expedition. One of the members of the expedition, Frank Goodman, had enough after just a month. Rapids had claimed one of their boats and most of their provisions. Goodman simply walked up to Major Powell and said, “I’ve had more excitement than a man deserves in a lifetime. I’m leaving. ” He then walked away toward a settlment. Goodman ended up hanging for many years with a bunch of Paiute Indians in Eastern Utah before settling and starting a family in Vernal, UT. He really did live to avoid excitement. I wonder if regretted it because the Powell Expedition of 1869 was headed for a place in history. 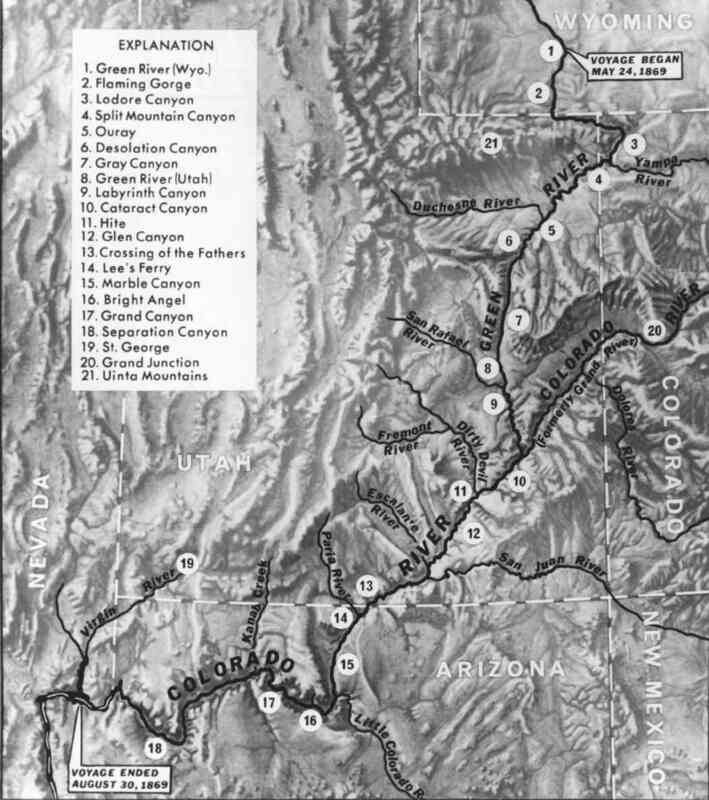 The 9 remaining men continued down the Green River to where it combined with the Grand River in Utah to form the Colorado River. In the days before dams, the Colorado River was described as “too thick to drink and too thin to plow. 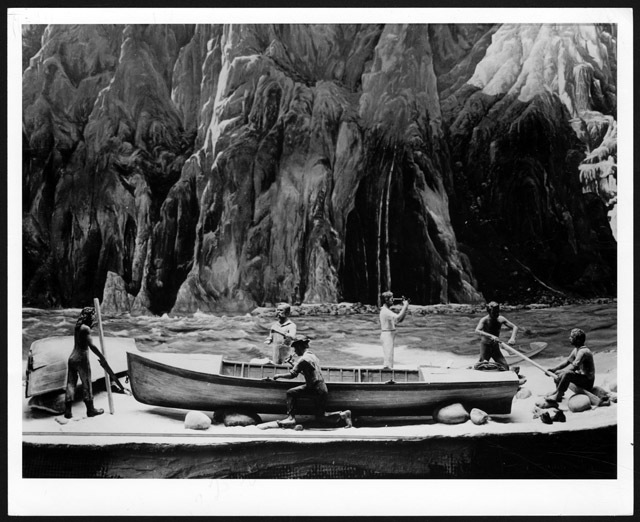 ” The water was not too thick for more rapids and Powell had determined on several occasions that the rapids were simply posed too great of a risk for his remaining boats and supplies. So, in some cases, they dragged the boats along the shore around the rapids. In other places, where the river was high or there was no bank, they were forced to shoot the rapids which had to be harrowing as they had penetrated so deep into the unknown that any mishap may have left them marooned. Indeed, the men were scared and at a place now known as Separation Canyon, Senaca and O.G. Howland along with Bill Dunn told Powell, “how we surely will all die if we continue on this journey.” They could not convince Powell to give up on the river as his spirit of determination would not allow Powell to give up even as the trio decided that they had enough and were going to try to hike their way to somewhere, anywhere but the river. Big mistake. All three men were killed by Shivwits Indians who thought they were three miners who had killed a woman. The Howlands and Dunn had a true sense of bad timing. 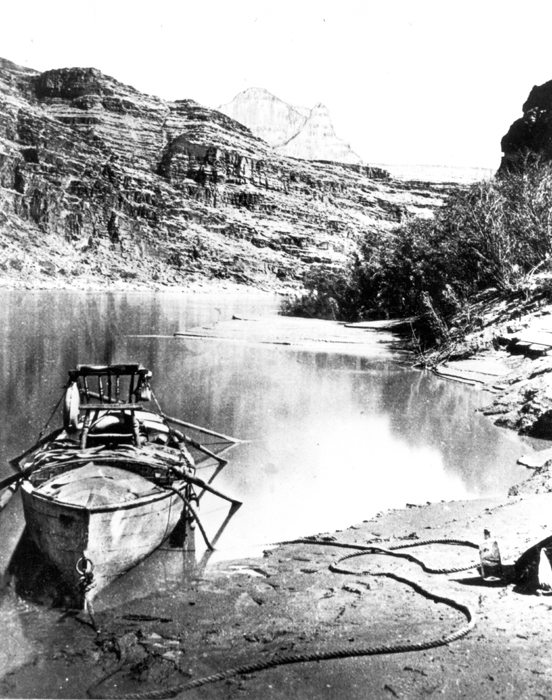 Within the next 48 hours, the remaining men managed the last two sets of rapids and came upon a fishing settlement at the mouth of the Virgin River, which is a Virgin no more since it now sits under Lake Meade. The expedition had been gone for 3 months and they had been presumed dead. 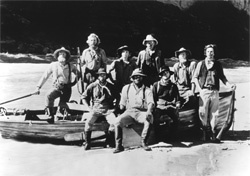 But the remaining sextet were very much alive and, had not only been the first to navigate the Green and Colorado Rivers, they had been the first to make it through the Grand Canyon and satisfy Powell’s theory that the river had preceded and cut the canyons as the plateau rose. Powell went on to chart the Grand Canyon and head both the U.S. Geological Survey and the Bureau of American Ethnology. 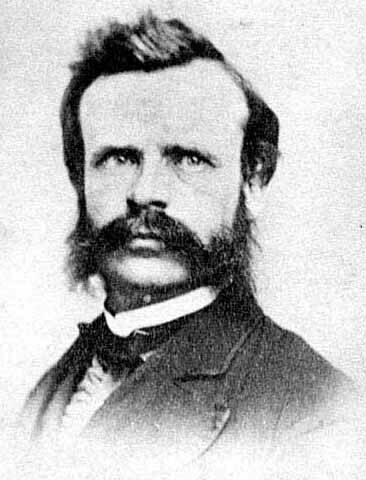 In the late 19th Century there was no scientific administrator more important than Major John Wesley Powell….and he owes it all to a pair of underwear. George Bradley suddenly was inspired. He took off his pants and then his long underwear. Bradley dangled the undergarment over the edge. 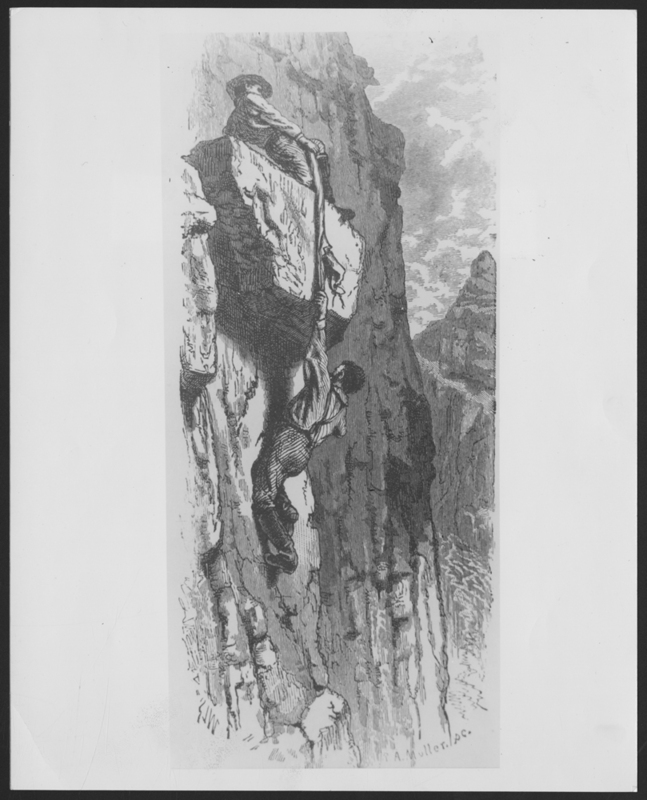 It was probably the only time in John Wesley Powell’s life that he was happy to see a man’s underwear dangling in his face. In a leap of desparation, Powell let go of the rock he was grasping to reach out for the longjohns. The underwear held and Bradley was able to pull Powell to safety. Powell lived to be able to write of the moment in his diary, complete the expedition, map the Grand Canyon and do all sorts of things. Before honoring John Wesley Powell for his important and long standing work as an explorere, scientist and administrator, we need to hoist a toast to George Bradley and his longjohns without which the nation may have been left without one of its greatest public servants. By the way, very few if any other expeditions dared to travel the length of the Colorado River like John Wesley Powell in 1869 and again in 1871 for the next 50 years. In 1923, the USGS sent its Chief Topographer, Claude Birdseye, to make a new survey and search for a suitable location for a dam which would become Hoover Dam. Birdseye’s choice of Boulder Canyon was abandoned after it was found to be inferior to a better spot in Black Canyon. Weather Bottom Line: One more day of excessive heat and humidity before we catch somewhat of a break. We may have a scattered t’storm in the mid 90’s heat of the afternoon but the best chances for rain that we’ve seen in a week will show up on Friday as a front approaches. As I had mentioned a few days ago, we need the rain as we are behind for the year which I find hard to believe but its true, officially. We won’t have a huge cooldown but look for highs in the upper 80’s with lower humidity for the weekend.